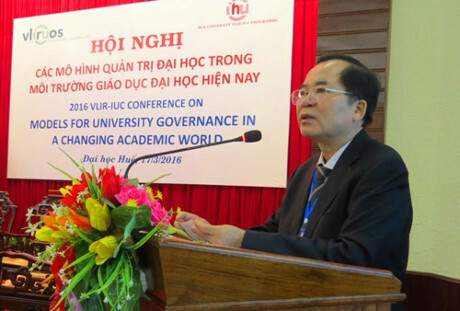 At the conference, there are 6 keynotes on university models and autonomy: 2-level university governance - Issues at Hue University (Prof. Dr. Nguyen Van Toan), Good Higher Education Governance: Concepts, Implementation and Training (Assoc. Prof. Dr. Le Quang Minh), University Autonomy: Reality and solutions for Vietnam university (Prof. Nguyen Minh Thuyet); Other university governance approaches such as investment, property management and governance of Vietnamese non-public universities (Dr. Dang Van Dinh), Stratification and Streaming in Vietnamese national education system (Prof. Lam Quang Thiep), Arizona State University Engagement in VN - Lessons Learnt for University Governance (Dr. Le Van Khoi). Hue University determines that innovation in management and governance of higher education is a need to meet the requirements of new situations and international integration and partners’ experience and international friends’ support is valuable to promote innovation in higher education. Based on the lessons learned in the fields of higher education governance shared at the conference, Hue University and its member colleges will choose and apply flexibly in its operation in order to contribute to the development of higher education and to meet national and regional development requirements. VLIR-IUC is the institutional university cooperation program between Hue University and Flemish universities and university colleges,Belgium, with the support of VLIR-UOS. The program aims to improve the university’s capacity of governance, training, scientific research and to ensure the quality of education based on research. In this program, "University governance capacity building" is one of its three key components. The implementation of the activities aims to enhance professionalism in the design and organization of the university, in the development of training programs, in the establishment of quality management models in training and research at university level and member units.